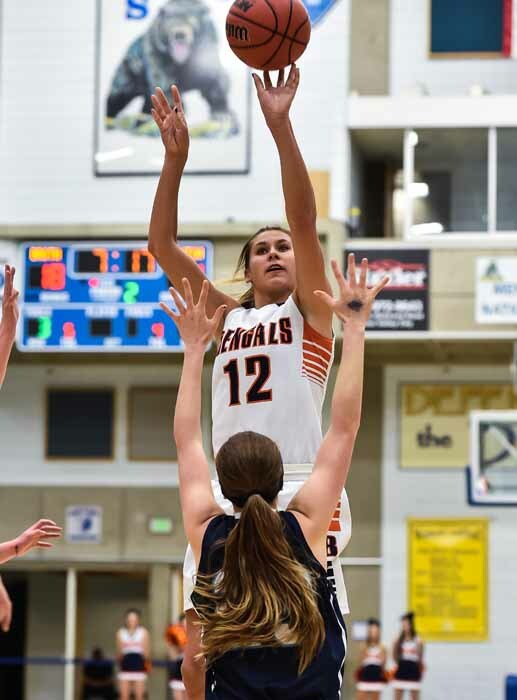 TAYLORSVILLE – A significant injury and some impressive individual performances have been among the top stories through the first two rounds of the 5A girls basketball state tournament at Salt Lake Community College. In terms of results, the favorites have played as advertised and the final four is much as we expected it would be. 1) Dani Barton injury – Brighton High sophomore Dani Barton is one of the state’s top players, and she joins with a group of seniors to put the Bengals into the position as one of the favorites in the 5A field. That appeared to take a hit Monday night during the second half of Brighton’s postseason opener against Westlake. The 5-foot-11 forward took the ball to the rim hard and came down on a Westlake defender, only she did not get up. After being helped from the floor and later carried from the gym with what looked like a serious ankle injury, it appeared highly likely that the Bengals would have to carry on without her. 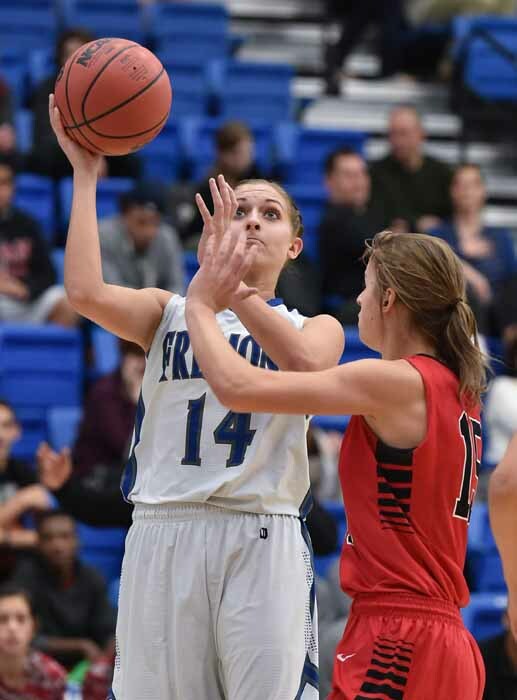 Laboring on that left ankle and struggling with lateral movement that limited her defensively and with elevating for rebounds, Barton was back on the floor two days later as Brighton knocked off Layton 50-46 to advance to the semifinals. The one thing that seemed unchanged despite the injury was her ability to get off her shot. After scoring 21 before leaving the Monday game, Barton was the leading Bengal scorer again against Layton, with 15 points. With an extremely talented Riverton team looming for Friday night, Barton’s ability to recover after playing on the injured ankle will be critical. Whatever limitations she has will put more responsibility on seniors Lindsey Johnson, McCall Christensen and Alyssa Hirschi to carry more of the load. Johnson came up big in the second half offensively against Layton, and Hirschi pretty much took over the game on the defensive end. The 6-foot forward had five rebounds, three steals and three blocked shots in the second half as Brighton closed out the Lancers. 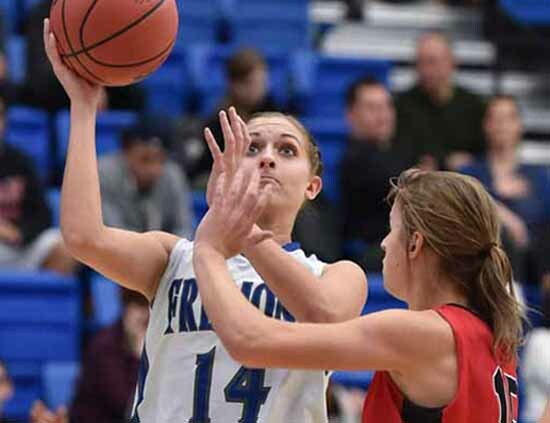 2) Fremont survives strong challenge – Led by senior Shelbee Molen, defending champion Fremont is back this year with another very strong team. Coming off a 59-19 win in their tournament opener, the Silver Wolves did nothing to lower the expectations as they headed towards a second-round battle with Region 4’s No. 3 seed Lone Peak, which had pulled a mild upset over Alta in the first round. Fremont led the Knights most of the night, and then Lone Peak made a run in the final period. Aubrey Wilson threw up a circus underhand shot at the 4:37 mark that tied things up at 46-46 and the contest see-sawed back and forth from there. The Knights had chances at the end to finish off the upset, but a critical area that had killed them all night long reared its ugly head one final time – the failure to secure a defensive rebound. With 12.4 seconds remaining, Molen misfired on a 3-point shot that would have given the Silver Wolves a one-point advantage. As the ball kicked off the rim to the back side, Fremont’s Harley Hansen was there to put it back in, tying the game at 54-54. One last opportunity remained for the Knights, and their leading scorer Kelsey McCann had the ball in her hands in a potential game-winning situation. The senior dribbled toward the lane, but ran into a triple team and tried to slip the ball forward to Megan Erickson in the lane. It seemed the pass caught Erickson by surprise and as she lunged forward in an attempt to secure the ball, she came into contact with Fremont defender Melanie Graves. A foul was whistled on Erickson with 1.3 ticks left on the clock, and after missing the initial free throw, Graves buried the second to provide the 55-54 margin of victory for the Silver Wolves. 3) Editorial comment…unfortunate whistle – I am not one who tends to criticize officials, and the contact between Erickson and Graves was clearly a foul by definition, but as a fan, this was a game that deserved an overtime. One second remaining, 80 feet away from the basket, an unintended contact, and the result is a game decided at the charity stripe. I get calling a foul when a shot attempt is interrupted with that amount of time left, but in a situation where the player was nowhere near position to get off a game-winning shot any other way, my vote would be to let the contact go and let the overtime ensue. 4) Harley Hansen – The star of the night at the defensive end was Fremont’s Harley Hansen. In Lone Peak’s win against Alta, Kelsey McCann had open looks all night long and hit six 3-pointers on the way to 22 total points. Friday was a very different story. With Hansen playing lock-down defense on the Lone Peak star, she hit just 3-of-13 shots and the lone trey she made came during the short stretch in the fourth period when the Silver Wolves went into a zone for a couple of possessions, and McCann got a clean look from the wing. 5) Survive and advance – It’s the age-old story at tournament time. It doesn’t have to be pretty, it just has to be a win. For a pair of Region 4 co-champions, American Fork and Riverton, that was the story Wednesday. 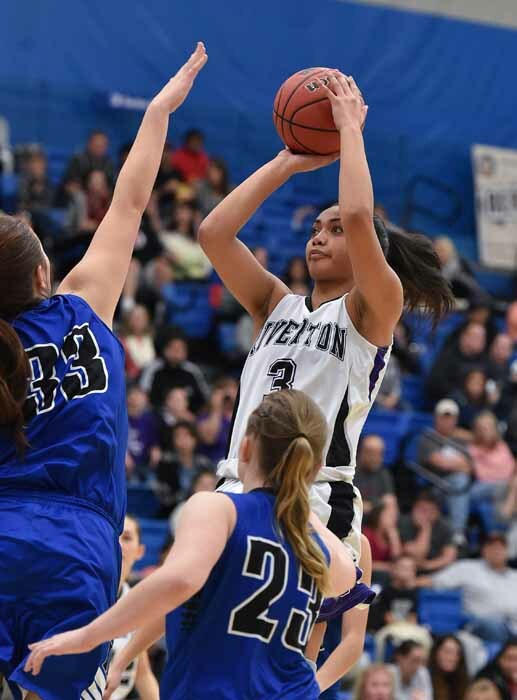 Neither win would qualify as a thing of beauty, but Riverton’s 52-46 win over Viewmont and the 45-36 win by the Lady Cavemen over Davis both count just the same, and both teams will be back at it Friday in the semifinal round. The Silverwolves turned to the high-low action at the start of the fourth quarter, with Rebecca McDougal feeding Tiena Afu three straight times on the same play. When it’s working, what else do you do? Turns out that play was there all night and Riverton used its balance to overcome a 26-point night from Katie Toole to secure the win. As for American Fork, it shot 33 percent from the floor, 17 percent from deep and 56 percent from the line, but still managed to move on. As good as these shooters are, those numbers should change significantly Friday, but if they don’t it could be a long night. 6) Conference matchups – It’s always interesting to see which regions are matched up head-to-head at the start of the 5A basketball tournament. This year, Region 3 and Region 4 were paired in four outstanding opening contests, with three Region 4 teams prevailing and pretty good teams from Alta, Copper Hills and Bingham dismissed in Round 1. On the other hand, Region 1 drew matchups with Region 2 top being the tournament, and the result was a couple of blowouts and a four-game sweep for the teams from Region 1. Only Fremont was able to win a second game in Round 2.